How’s this for a statistic? “Analysis of the three popular diets (The Atkins Diet, The South Beach Diet, and the DASH Diet) found that an average calorie intake of 27,575 ± 4660.72 kcal would be required to achieve sufficiency in all 27 micronutrients (vitamins and minerals)." —Journal of Integrative Sports Nutrition, study conducted by Jayson B. Calton, 2010. Before you make any changes to your eating as part of a New Year health goal, let’s talk through what real HEALTH requires from your eating and where to find what you need to be healthy! (HINT: this blog comes with a FREE printable download with all the information you’ll need). For the last several decades, we have seen a whirlwind of diet crazes take over society. These diets have largely only been focused on adjusting MACRONUTRIENTS as a way to lower overall calories and lose weight. When I was growing up, everything was “low fat” as I followed whatever Oprah Winfrey was talking about! Then, shortly after came the "low carb” diets which seemed to help people a lot more. The Atkins diet and the South Beach diet were diet book sensations that we’ve not witnessed since. Now, in this day and age, we see some modifications to the low carb diets with the wave of Paleo style eating all the rave. 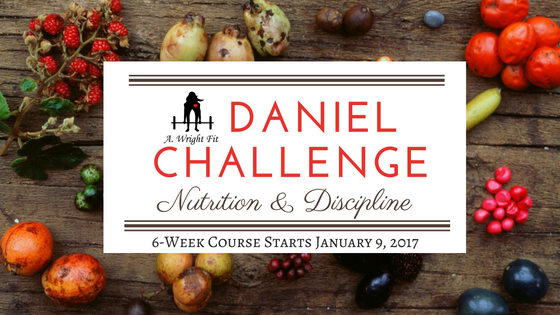 As a Certified Nutrition Coach, I can assure you with 100% certainty, that there are over a dozen different ways that you can lose weight. You can probably lose weight with all 3 of the options I listed above! Focusing on your macronutrients is important so you can find the right balance of eating that gives you the right kinds of energy and helps you lose excess weight or unwanted body fat. The first requires that you focus on ways to reduce your overall calories. Omitting complete macronutrient groups, such as carbs and fat, are certainly effective in this way, but is it really healthy? But being TRULY health means that you need to focus not only on what helps you maintain a health weight, but also what gives you boosted energy, a strong immunity and resistance to sickness and disease, and the quality of life that you not only desire, but deserve from this life. Yes, as a Faith-based health coach, I know that God has created you on purpose and for a purpose. And whatever that purpose is in your life will require the help of a thriving body, your high functioning brain, and your longevity. So, when we’re talking about making changes in your health, you can’t just concern yourself with MACRONUTRIENTS. We need to make room for the MICRONUTRIENTS as well, i.e. the vitamins and minerals. While I won’t get into all the details here and now, the information I am going to give you below has all the vital vitamins and minerals listed and described, as well Daily Recommended Values (DRI’s) for women to get per day. What I found simply astonishing from the study conducted by Jayson B. Calton (referenced above) was just how deficient these incredibly common these popular “weight loss” diets were in the VITALLY important vitamins and minerals that keep a body running efficiently and effectively! You can’t afford to eat 27,000 calories per day, but you also can’t afford to be so deficient in the vitamins and minerals you need to live well! Well, I know that the majority of you might be thinking, “Well, I’m good, I take my multivitamin every day!” You would be among the rest of the 50% of society who is with you, but unfortunately, you might be wasting your money. Studies are also showing that the supplemental form of these vitamins and minerals are not effective as they should be and could very well be doing more HARM than good. Studies (and here) of over 400,000 participants showed that those who took a multivitamin every day actually had an increased rate of mortality! Even if it’s not at risk for death, you might be at risk for reaching toxic upper levels which can harm you too and make the vitamins less effective, much like antibiotic resistance. Other studies reveal that when vitamins and minerals are taken out of the foods, or worse yet, chemically manufactured, they are not absorbed by the body effectively. It is the synergy of the vitamin and mineral in conjunction with other vitamins and substances naturally present in food that makes them bioavailable to be effectively absorbed in the gut lining of your small intestine, predominantly. There is not as much regulation over supplements, including vitamins and minerals, since the Federal Drug Administration (FDA) does NOT fully monitor the now nearly $50 BILLION (!!) supplement industry. Worse yet, Consumer Reports went on the record to show as of 2009 the FDA had never once surveyed the China ingredient factories, where the bulk of the ingredients come from that go into our supplements in the US. Vitamins, minerals and supplements are now well known to have traces of metals, like lead, that can prove to be toxic and life threatening at certain amounts. Only take those vitamins and minerals that you have been tested as deficient in, you can self test somewhat effectively, but for your best bet have your doctor check at your annual check-up. If you are a special group such as vegetarian or vegan, you would want to take Vitamin B12, for example. If you live in a cold, drab city, you may need to take Vitamin D during the winter months, etc. If you are pregnant, it is recommended that you ensure you get enough folic acid for fetal development. Choose whole food sources of supplements. Enquire into some good resources and be prepared that these whole food sources are going to be more expensive, but worth it. So, you’re getting the picture that by cutting out whole food groups and macronutrients might help you lose weight but not make you HEALTHY... and a multivitamin isn’t the risk worth taking either! So we see that, WHOLE, REAL foods are the answer to this problem. But as you are thinking about that, you are probably also thinking about a number of challenges. It’s a challenge to know what foods to get these vitamins and minerals from. It’s a challenge to how much of each food you should eat to get the right amount for you. It’s a challenge to ensure that when you attempt to eat these foods, you aren’t overly consuming calories that would cause you to gain weight! WELL, I HAVE A SOLUTION!! I have done the work of putting together the list of the TOP 10 MOST COMMON NUTRIENT DEFICIENCIES AND WHERE TO FIND THEM. You can download this HERE. The reason why I focused on the nutrient deficiencies is I want to encourage you that if you live in a modern city and have access to and eat a couple servings of vegetables and fruit per day, you are not likely too deficient in some of the more prevalent vitamins and minerals like Vitamin C, etc. 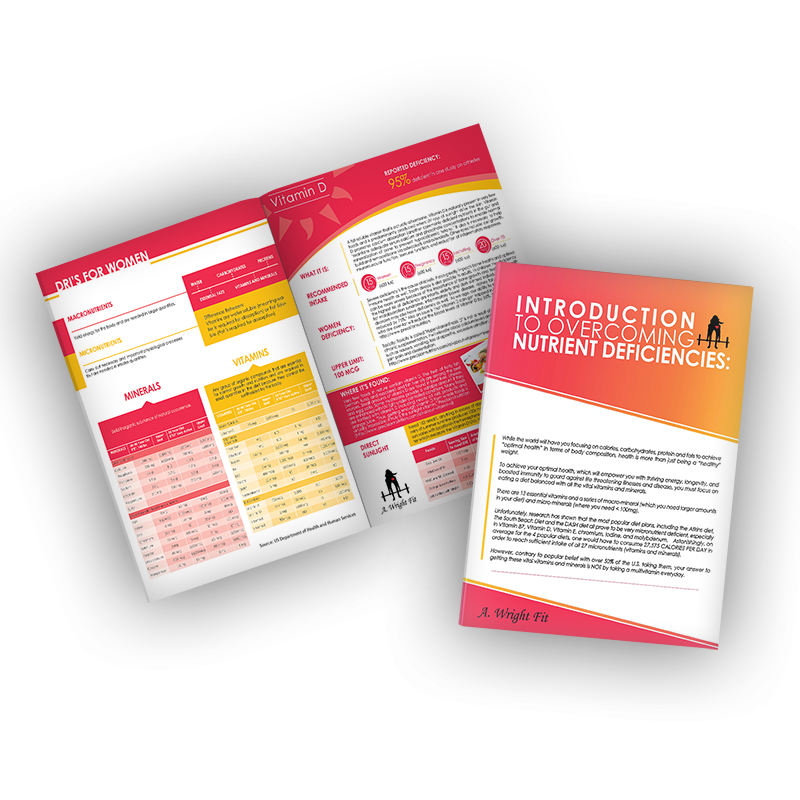 The good thing about this FREE Nutrient Deficiency packet is you will learn not only how much you need of each of these common deficiencies, but what foods you can find them in, how much of each food you need to eat to get the RDI, AND how many calories, fat, carbs and protein grams you’ll be ingesting to reach those levels! 10 Tbs of peanut butter (at 950 calories, 80 grams of fat, 35 grams of protein, 40 grams of carbohydrates, and 10 grams of fiber). You can see there is a wide variety of foods with a wide effect on your health because of the number of calories, and macronutrient breakdown! To put it all together for you, I also have included 2 sample days that build all this information into a MEAL PLAN that would allow you to reach all your nutrient sufficiency, but to also stay under 1700 calories per day! 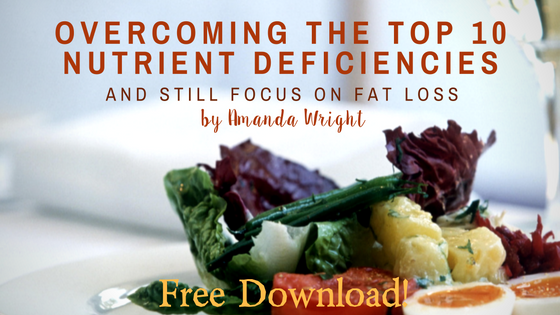 GET YOUR FREE "TOP 10 NUTRIENT DEFICIENCIES AND WHERE TO FIND THEM FOR LESS CALORIES” DOWNLOAD HERE. When you are done reviewing this information, comment below and tell me what you learned, what you like and what you don’t like about this knowledge! I’ll respond to all comments and carry on this conversation! Here’s to your health and heart in 2017!